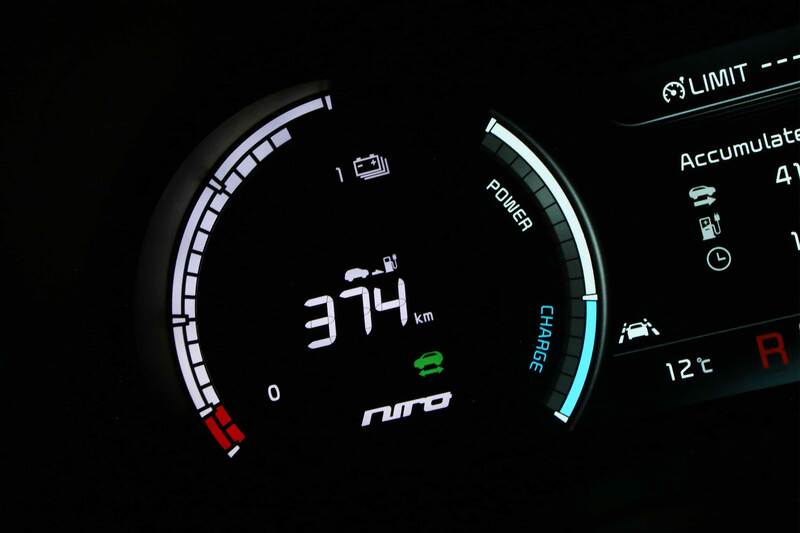 Earlier this year, we were seriously impressed by the new Nissan Leaf. 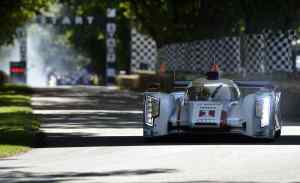 The original mainstream electric car had, in second-generation guise, moved the game on again. 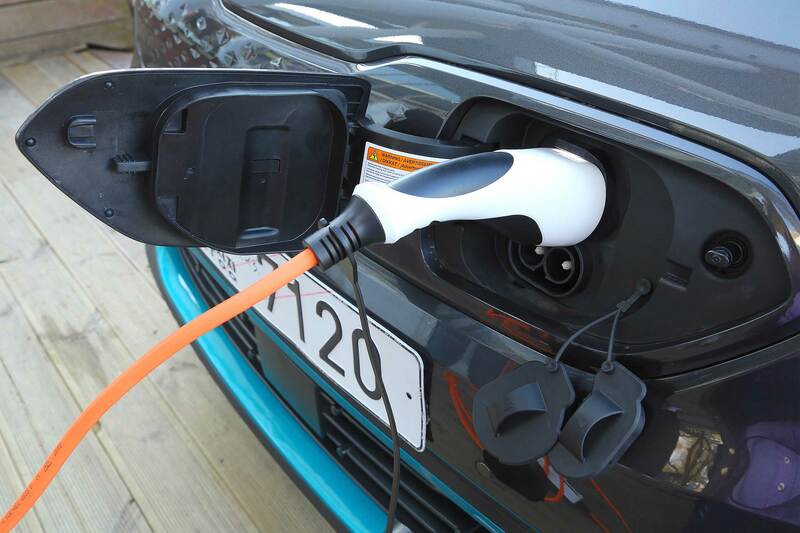 Those seeking a (relatively) affordable EV need look no further. But it’s a sign of how quickly the electric car market is developing that the new Leaf has already been outsmarted by a brand-new electric car from Kia: the e-Niro. The firm is very excited by it, and says it simply won’t be able to meet expected demand when it goes on sale in April 2019. Why the excitement? Because, unlike the now-meagre 40kWh battery pack in the Leaf, it offers a far greater capacity of 64kWh. The range improves accordingly: in latest-era WLTP testing, the Leaf achieves 168 miles. The e-Niro can cover 282 miles. That’s a vast, 114-mile advantage. Of course, it costs more – adding capacity to batteries is expensive – but it’s not as pricey as you’d think. After the Plug-in Car Grant, the Leaf costs from £26,190, or £29,390 in top-spec guise. Kia’s only selling the e-Niro in range-topping First Edition form – for (post-grant) £32,995. For early adopters, more range is more important than paying less. Kia already has an enormous advantage here. And, as we’ll see, it’s not the only area in which the e-Niro betters the Leaf. 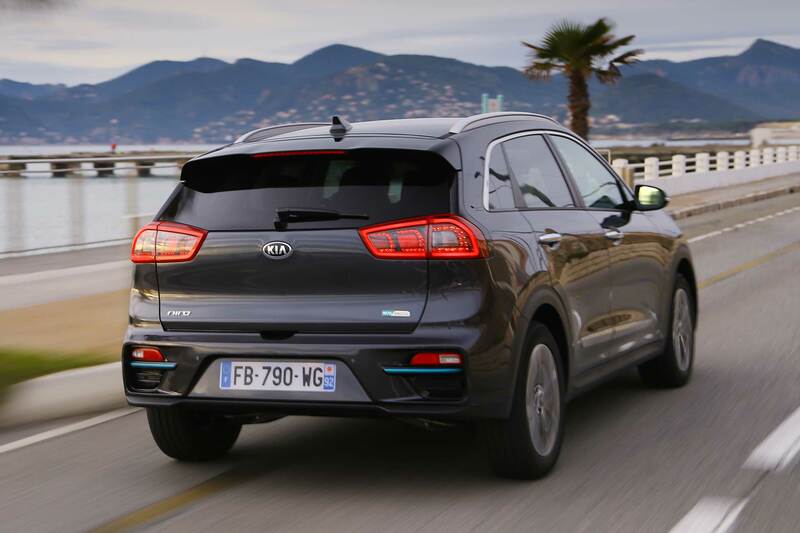 The Kia Niro has been on sale for a couple of years, first as a hybrid and later as a plug-in hybrid. The e-Niro is the third electrified version – making it the only crossover SUV on sale with three choices of alternative fuel power. It sits neatly between the Ceed family hatch and the Sportage SUV. Length of 4,375mm makes it 115mm shorter than a Leaf, but it’s wider and taller. It’s visually squarer too, a more space-efficient shape than the angular Leaf, with contours on the sides taking the edge off its boxiness. You can tell an e-Niro apart from a regular Niro because the electric version has new front and rear bumpers. The front end has lots of blue accents and ‘arrowhead’ daytime running LEDs. It also has a closed-off grille, into which the charge socket is integrated. Polished 17-inch alloys are standard. 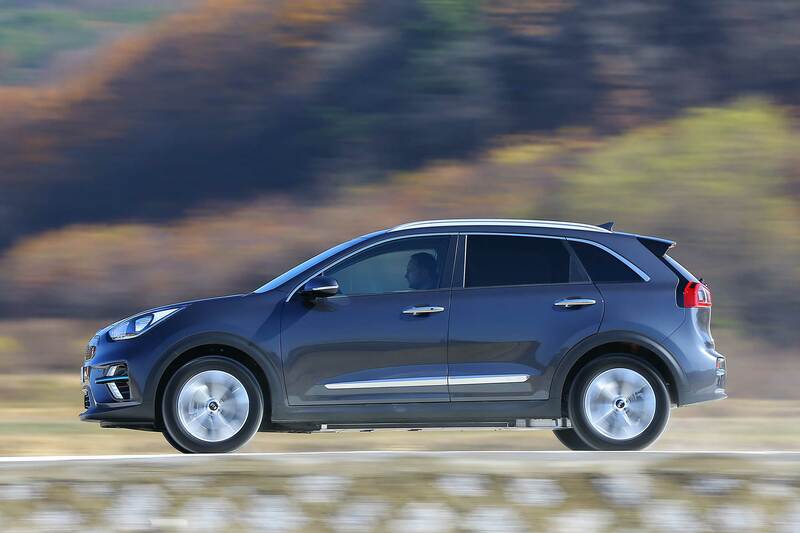 Kia is offering it in five colours in the UK, including a unique-to-e-Niro shade called Pluto Brown. 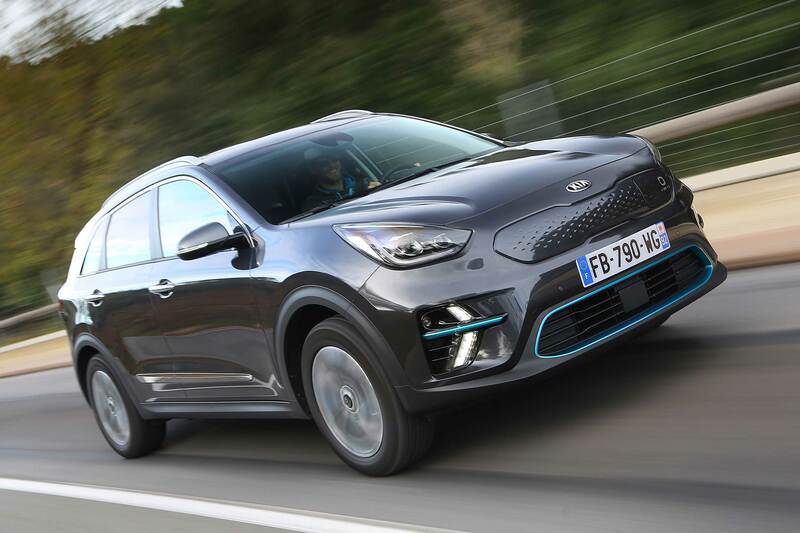 The e-Niro isn’t as standout as the hugely popular Sportage, but it should appeal to families who want something less obviously ‘different’. It’s an electric car that doesn’t shout about being one. For some, this will fit the bill perfectly, even if others might think it a bit bland-looking. The raised crossover stance is realised inside, with a higher seating position than a normal family hatchback. It’s almost as raised-up as an SUV, which most people will love. And it’s a big contrast to the lower-slung Leaf. The e-Niro is also considerably roomier inside than the Nissan. 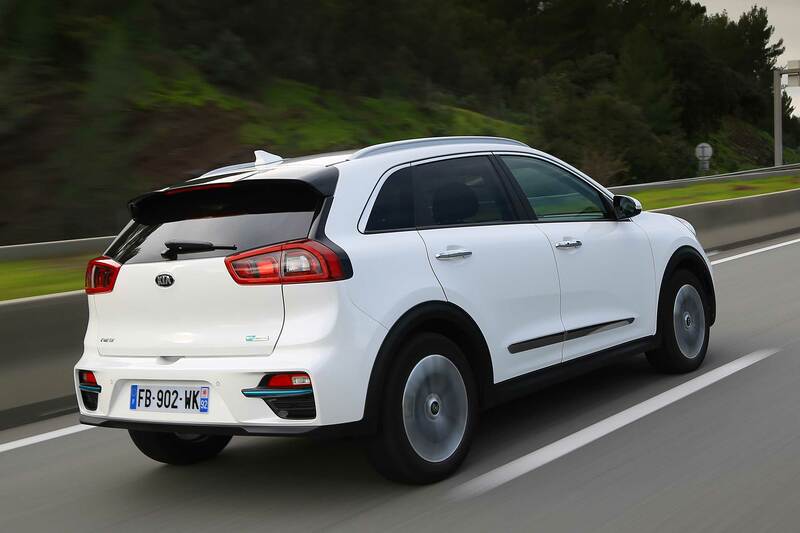 Where the Leaf can feel a bit cramped, the Kia is very light and airy, with lots of space in the front and a roomy rear. Windows are big, the view out is clear and the open-plan dashboard sitting below a wide, deep windscreen means it doesn’t feel claustrophobic. Only a slightly high rear floor compromises back-seat comfort (it’s higher than a normal Niro to squeeze in all the batteries). 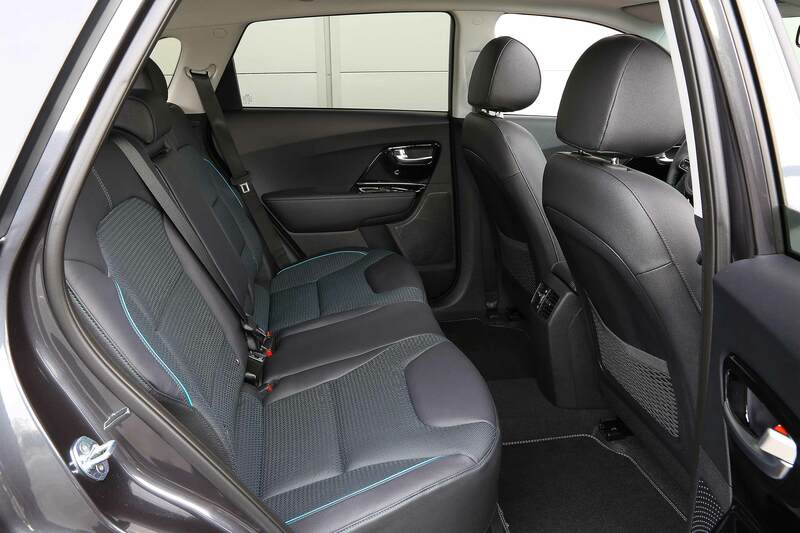 There’s not enough space to get big feet under the front seats, so passengers might feel a little perched, although there’s lots of kneeroom and actually more headroom than in a Sportage. Kia has worked out there’s a full 63mm more legroom in the back than a Leaf. The boot is similarly commodious, at 451 litres. The average for the family hatch sector is around 370 litres. Up front is a rather plain but well-built dashboard, with plenty of soft-touch plastics and little hint of shiny cheapness. 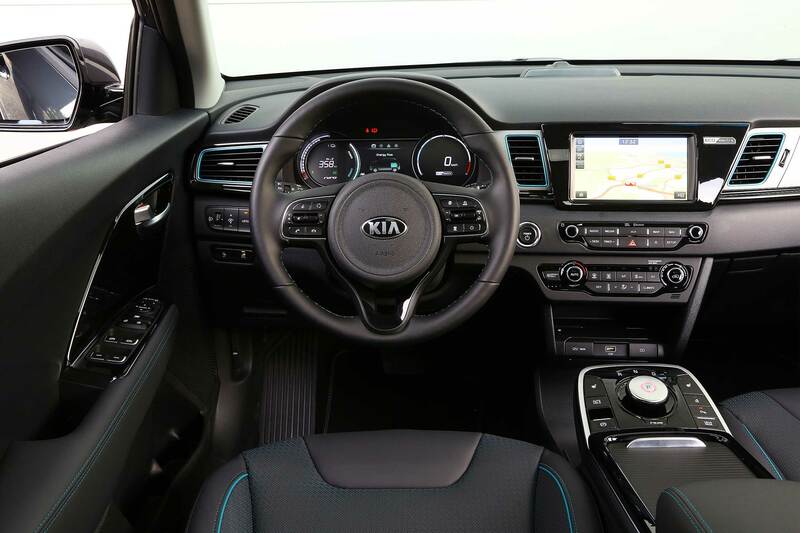 The instrument pack is easy to read – remaining range is displayed in big numerals in the left-hand dial – and the touchscreen infotainment is standard Kia fare (although a bigger screen would be nice). Seats are firm and comfortable, and offer a tremendous range of fore and aft adjustment. 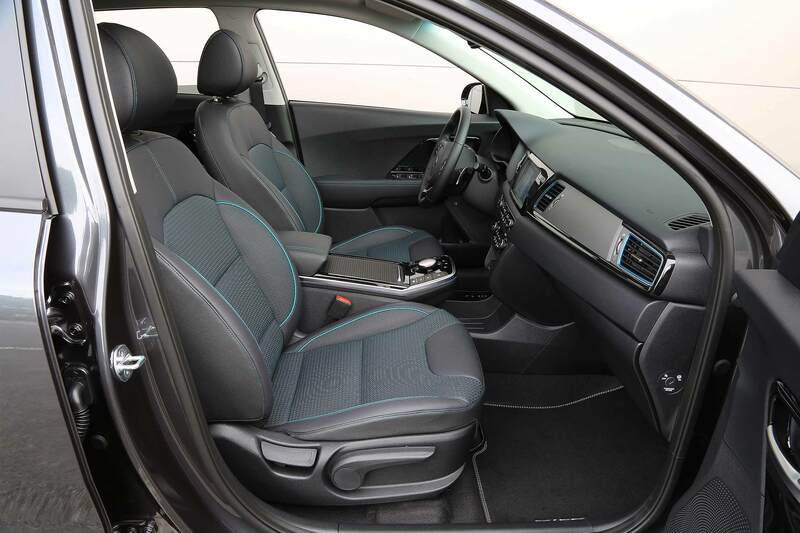 A huge amount of oddment stowage sits between them; Kia has fitted a ‘wireless’ gearshift dial, and used the space to fit a shelf at the bottom of the centre console, which also includes a wireless smartphone charger. This compensates for door bins that are a little narrow. The e-Niro is more than just a regular Niro with the engine swapped out. 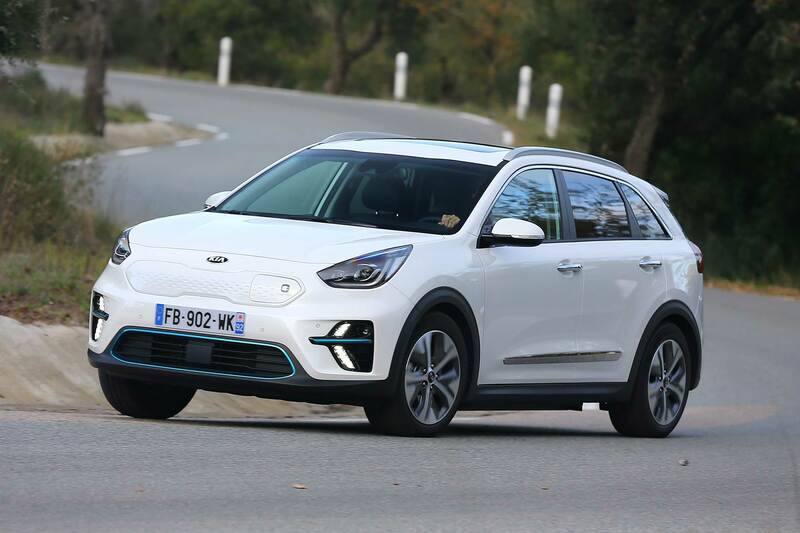 Kia has made lots of engineering changes, largely to deliver the extra refinement expected of an electric car. They include new soundproofing, new carpets, more under-floor isolation, a battery pack suspended on rubber mounts and changes to both front and rear suspension. When you drive away, the uncanny silence of an electric car is plentifully evident. It really does glide, with just the faint chime of the audible low-speed warning device for pedestrians and, as you accelerate, the smooth whirr of the electric motor. As speeds rise, so do wind and road noise but, other than the occasional grumble over certain road surfaces, the e-Niro keeps its refined manners. Other sources of noise are filtered out, too. It doesn’t crash or bang over bumps, for example. The ride itself is also smooth and supple, aided by its considerable weight (almost 1,800kg). 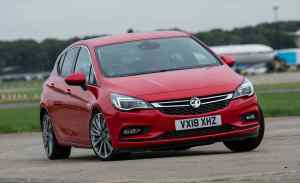 This does mean handling is a bit soft and squidgy, with a fair amount of roll, but robust, high-end suspension still gives it a sense of integrity. Just don’t expect it to handle like a hot hatch. It all makes for a clean and sophisticated-feeling drive, which is reinforced by superb performance from the electric motor. The instant, seamless, single-gear acceleration of electric cars is always appealing, but this feels particularly confident, because it has so much power. A 204hp output is warm hatch territory, backed up by a huge 292lb ft of pulling power – it has the muscle of a punchy diesel but none of the noise. Zero to 62mph in 7.8 seconds is quicker than all but the highest-performance family-sized SUVs. Indeed, so much surge does it have, it’s easy to get the front wheels squealing on twisting roads. Pressing the accelerator can give a sudden slip, before it’s reigned in by the traction control. Be liberal with such power and it can lurch a bit, too. It will be interesting to see what the e-Niro is like in the rain, but we can’t see many electric car owners complaining that their car has too much power. You soon learn to be easier on the accelerator pedal. There are two paddles behind the steering wheel, which can be used to alter the amount of electric energy regenerated when you lift off the accelerator. This can be stepped up and down between four levels; with practice, you can use the paddles instead of the brake pedal. Holding down the left hand pedal adds further battery regeneration and braking power, and can even bring the car to a compete standstill – it’s a really neat feature. The regen mode can also be set to ‘auto’, which uses a forward facing camera to vary regeneration in traffic. As the car slows down, the e-Niro will slow too, again creating electricity to store in the battery. This happens automatically, and is extremely clever indeed. You almost never need to use the brakes, even in varying traffic. In reality, having a claimed range of 282 miles means the e-Niro can be driven without anxiety. Our test route took us into the mountains around Nice, which we looped twice, at high speed, and still we had more than half our range still remaining. We didn’t give it a second thought, despite hours behind the wheel. 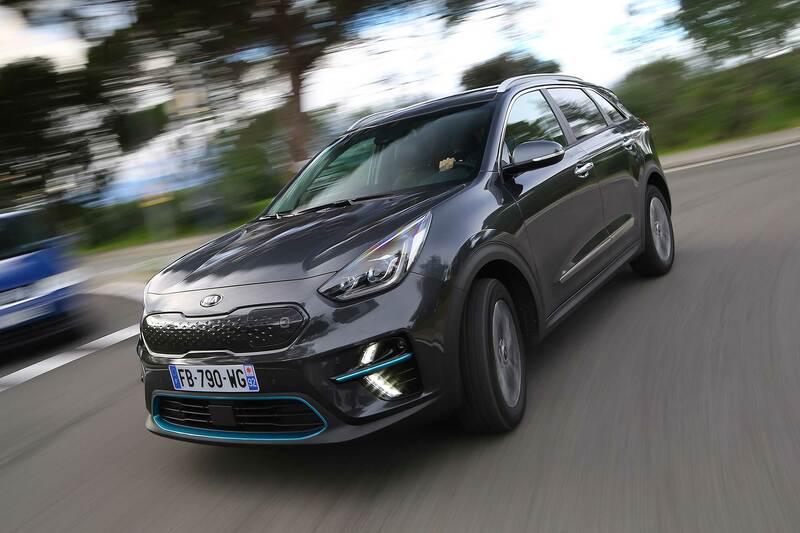 The Kia e-Niro makes range anxiety in affordable electric cars a thing of the past. 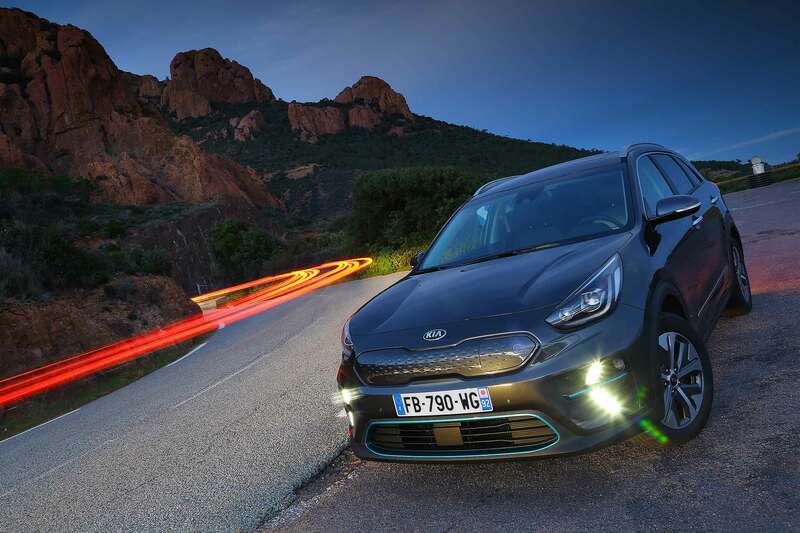 The Kia e-Niro is another seriously impressive electric car. It has an enormous range, will be able to use 100kW fast chargers for top-ups in less than an hour, and is also very roomy and practical. It is, even by electric car standards, extremely refined, too. While it’s neat and tidy to drive, with lots of ride comfort, the handling isn’t as crisp as it could be – although we don’t expect this to be a big issue. The somewhat bland and boxy looks, paired with a solid but plain interior, are a slightly bigger issue, particularly as it will be sitting in showrooms alongside such a visually appealing car as the latest Sportage. 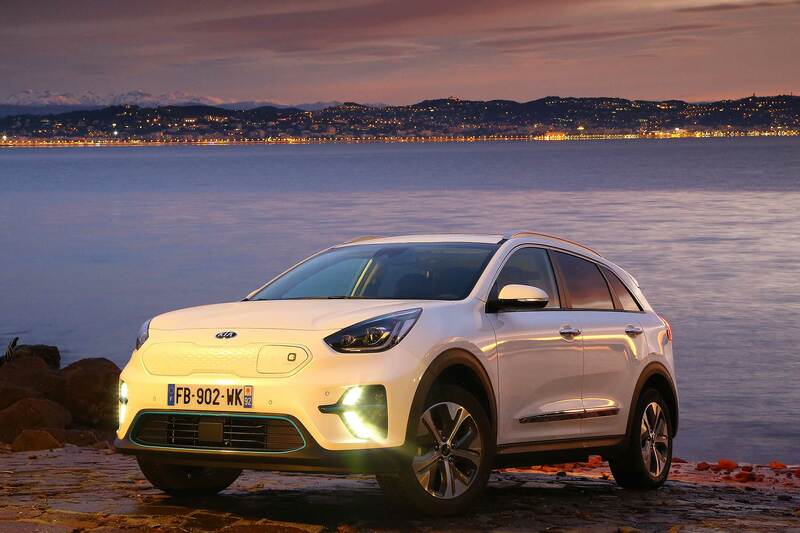 In truth, the Kia e-Niro’s biggest problem could be simply availability. Kia may only get around 1,000 cars a year to sell, which is likely to leave some frustrated. It’s an electric car ready for full-on family use… but families may have a fight to get hold of one. It’s the best ‘everyman’ electric car we’ve yet seen. Now, Kia, try to see if you can bring in enough to realise this EV’s potential.